If you already created a business listing, there are 4 main reasons why your business is not showing on Google Maps which are: your Google My Business listing is not verified, you lack location authority in Google Maps, your GMB listing is suspended, or you’ve relocated your business. We’ll dive further into each of these 4 reasons in more detail below. So keep reading to find out why your business is not showing in Google Maps! With the explosion in mobile and voice search – think Google app, Siri, Alexa, and Google Home devices – one of the most common questions we are getting is why doesn’t my business show on Google Maps? Today, we are going to answer that question and give a lot more context around the topic of Google Maps SEO, Google My Business listings, and overall Local SEO strategies and techniques that your can deploy to connect to more customers who are searching for what you offer. Get ready, because the content below has a mix of video, podcast audio, and several collected articles from the past on the top of getting your business to show on Google Maps. Update: July 13th, 2018: I recently expanded this content to “6 reasons why your business isn’t showing up in Google Maps” and did a video. The reason I added 2 more reasons is from recent conversations with business owners about the issues they see with their Google My Business listings, and how these issues are impacting their presence in Google Maps. This is a summary of the 4 most common reasons we see why businesses are not showing up in Google Maps or their Google My Business listing is not showing properly. There are many nuances within these three causes for a business not appearing in Google Maps. But to keep it simply and to give you actionable steps to take to resolve your problem, I’m going to highlight the main causes as they make up easily 90% of the reason why your business isn’t showing up in Google Maps. First, let me show you the easiest way to tell if your business is verified in Google Maps. Go to Google and search your business name. Now look directly to the right of the “Suggest an edit” link, and if you don’t see a second link called “Own this business?”, then your GMB listing is verified. If you see that second link “Own this business?”, then your GMB listing / business IS NOT verified in Google Maps. Again, the listing above with the “Own this business?” link showing is the one that IS NOT verified in Google Maps. Even though this particular unverified GMB listing will in fact show up in Google Maps listings, this is not the norm and you should not expect your business to appear in maps without verification. If your Google My Business listing is not verified, then your listing is not eligible to appear in Google Maps… it’s that simple. Add just a little bit of competition to the mix, and it’s highly unlikely your business will appear in Google Maps. In hyper competitive markets such as lawyers, doctors, or home services, if your GMB listing is not verified, you have virtually 0% chance of even showing up. There are several ways you go about verifying your Google My Business listing for your business, and Google has a great guide illustrating the process for each which you can read here. The most common way businesses verify their GMB listing is by creating the listing in Google My Business and requesting a postcard to be sent to your business address. What does the Google My Business verification post card look like? The Google My Business verification postcard can easily be construed as spam mail if the person receiving mail at your business isn’t aware the post card is on the way. So once you setup your Google My Business listing and request your post card, make sure you notify the right personnel that a Google postcard is on the way. Once you receive the post card from Google, you’ll simple take the code on the postcard and enter it into the verification box in your Google My Business listing. What you do once you receive the Google My Business verification code? Once you have your code, you’ll simply enter it into the box that says “PIN” and click submit. But I’m still not showing up in Google Maps! You went through the process of verifying your Google My Business listing and successfully verified your listing with the code Google sent, but you still aren’t showing up in Google Maps! Verifying your Google My Business listing is the first step to making your business eligible to appear in Google Maps. I hate to be bearer of bad news, but verification is not your ticket to the top rankings in Google local search. You may find an example or two where a business shows up on page 1 in Google Maps search results after verification. But move into more competitive waters (large metro areas, hyper competitive categories), and you may find yourself somewhere out on page 2, 3, or 4 for your high value / highly competitive keyword phrases. We invented a phrase here at Bipper Media that we found to best illustrate what it takes to appear in the top local / Google Maps search results in hyper competitive markets. And that phrase is Location Authority. Read more: What is Location Authority? Location Authority: the ranking power, or fuel that drives rankings, for any local business or location in Google local / Google Maps search results. In other words, the more location authority your business has, the higher it will rank in Google local search results. When we describe local SEO to clients, we typically use the term location authority. But apparently this is a phrase that’s unique in the local SEO world as many of our clients and prospective clients are not familiar with the term. In order to achieve location authority and compete in the local / Google Maps search results, you in essence need more location authority than all other competing listings in your defined market and radius. And the foundation of location authority is accuracy and consistency of your business information published throughout the web. The citation for your business that you distribute throughout the web should match exactly to your Google My Business listing. We call this using your GMB listing as the base or foundation for all other citations published around the web. Read more: What are citations? Another simplified example I’ll use is the citation for Bipper Media. You can get a feel for the scale and magnitude of the citation distribute network we use here at Bipper Media for our local SEO clients. 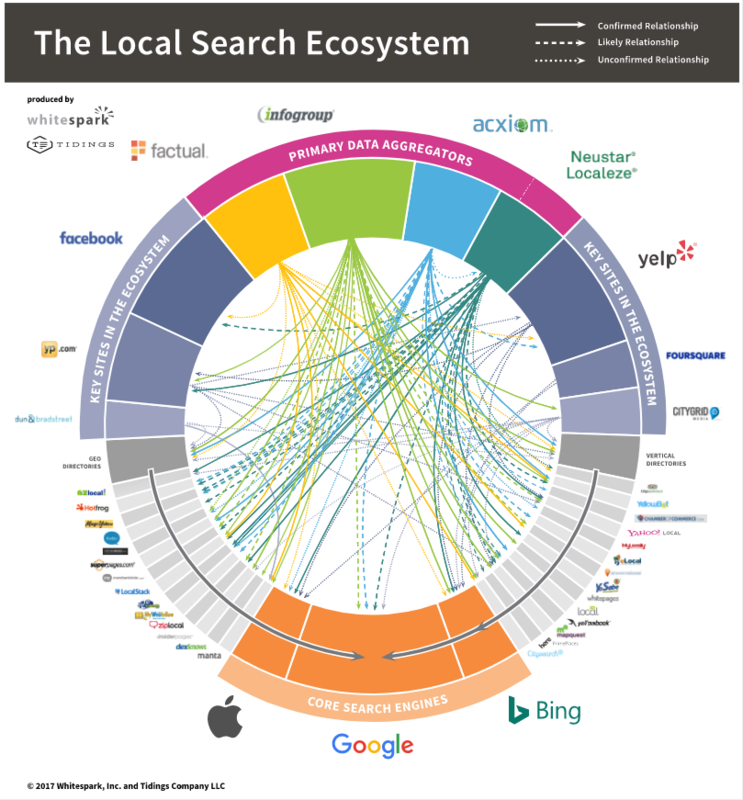 Another great example of the local citation ecosystem, you can check out the graph put together by White Spark. How does citation distribution build location authority? In a lot of ways, when you publish your business citation on other sites, the impact it has on your Google Maps rankings is similar to the impact building backlinks to your website has on organic search rankings. But just publishing your citations throughout the web isn’t the right approach to building location authority. You need to build citations on sites that matter, and that are relevant to your both your industry and location. But then you should work to get citations published on industry specific sites as well. For example, we manage an internal list of resources specifically for lawyers and law firms. We’ve also compiled a list of directories for dentists, which are great sources for building industry specific citations and will drive a lot of value and location authority. In summary, by building citations in a strategic, purposeful fashion, you can drive tremendous growth in location authority for your local business. And again, the more location authority your business has in Google Maps, the higher you’ll rank in Google local search and the more traffic, phone calls, and business you’ll get from people searching for your type of business, products, and services. One of the worst experiences a business owner can face is waking up to the fact that their business has been removed from Google Maps. We get calls frequently from business owners who are in a panic because their GMB listing is no longer showing up in Google search. This panic is compounded if the business was previously ranking in the top 3 Google local search results. Ah yes, the dreaded “Suspended” message in Google My Business. There are numerous reasons as to why a GMB listing has been suspended. The most frustrating part is that Google will tell you exactly why your GMB listing has been suspended in the first place, which leaves you with the unpleasant process of reverse engineering what’s wrong. Here are some of the common reasons we’ve seen for suspended GMB listings. You updated your business information on your Google My Business listing and Google just waiting to verify the information. Google’s system is questioning the validity of your office location and wants a picture of your front office. You can read a great article from Search Engine Land on the common causes for GMB listings being suspended here. When you find yourself faced with a suspended Google My Business listing, one of the easiest ways to expedite the troubleshooting process is to simply call Google Local help. You used to be able to call Google Local support directly from your Google My Business dashboard. Today, the way we call Google Local support is by first calling Google Adwords support, and then selecting the option for Google My Business. It’s a bit of a pain to work through the process of call Google Local support. But if you are faced with a suspended Google My Business listing, then it’s well worth the trouble to see what’s going on with your listing. Finally, we’ve seen many businesses disappear from Google Maps after they have relocated. First, keeping up with the changing of your business address after you move implies that you are engaged and actively managing your Google My Business. Most cases we’ve seen are where the business owner was not actively managing their Google My Business listing. So when they moved, they didn’t have a point of reference to begin with as to the status of their GMB listing. But when Google picks up on the fact that your business now has a new address, and without any supporting data indicating a move had occurred, the common response is that your GMB listing get suspended. And once your GMB listing is suspended, you typically fall off Google Maps search results. The best way to mitigate this problem is to make sure you are proactive with the management of your GMB listing. And once you open the doors at your new location, you should immediately update your Google My Business listing to reflect the new street address. Just keep in mind that when you update your street address, it is possible that Google will request you to re verify your new address. If Google requests you to reverify, you will have to go back through the process of requesting a postcard and entering your verification code. You may see other options for verification during this process as well. We’ve seen several cases where Google will allow a business to verify the new address through email or phone. I’ve seen these options most often with businesses that are reverifying a location or have moved to a new address. I do not typically see these options for new verifications. Once you go through the process of verifying your new office address, you will more than likely see your business appear back in Google Maps. In this podcast episode, we dive deeper into the main reasons why your business can’t be found in Google Maps. Subscribe to the SEO Secrets podcast to get more great SEO tips, tools, and tactics from Bipper Media. We’ve recently being see anomalies in local search results where Google Maps listings (GMB listings) are disappearing and all we see are Google organic listings. We use to see Google Maps / Google local listings appearing for this search result, and in smaller metro areas we are even seeing this with keyword phrases like “auto accident lawyer”. Another example we’ve seen lately is with a dental practice that specializes in “zirconia dental implants”. This dental practice was always in the #1 local map search results for this keyword phrase. However, about 6 weeks ago they completely disappeared and have been replaced by what they say is a “random list of dental practices. I also think there’s more going on here with these recent anomalies! I think Google Maps is getting more refined with their local search results. As such, niche business categories like “truck accident lawyer” and “zirconia dental implants” are being upended by their top level category counterparts such as “personal injury lawyers” and “dentists” or “dental implants periodontist”, all of which are primary categories in Google My Business. Also, I think it’s pointing to an untapped optimization strategy for GMB which is the service menus. Just like restaurants could build out their complete menus in GMB, any local business can now build out product and service menus within their Google My Business listings. So for example, a personal injury law firm and now build out subcategories optimized for “truck accident lawyer” and “car accident lawyer”. And the “dentist” or “dental implants periodontist” can now build out subcategories optimized for “zirconia dental implants”. I talk more about this on our latest episode of the SEO Secrets podcast which you can subscribe to here. Brand capital is an important influencer in driving the location authority of your business. Brand capital will help your business get found more frequently in Google local search because you’ll achieve higher rankings for a wider range of search phrases. So the more brand capital you have, the higher your level of location authority. The more location authority you have, the more productive and prominent your business will be in local search. How to increase brand capital in your local market? Refer to point #2 below where I talk about Location Authority. But in summary for this update, the best way we’ve found to increase brand capital in local markets is through a combination of citation distribution, local news & information blogging, and social media distribution of those blog posts. This 3 way combination packs a punch that is drives substantial brand capital for any local business. And the more consistent a business is over time with these 3 actions, the more brand capital you build and the more location authority you achieve. Here’s a quick summary of the 4 reasons why your business may not be showing up in Google Maps. However, we encourage you to scroll down to get more details into each of these reasons. Also, there could be many other reasons causing problems with your Google My Business listings in Googles. We’d be more than happy to take a look at your exact situation and provide you with some insights that could help you resolve your issues with Google Maps. Simply reach out to us to get a free analysis. One of the more common questions I get is why isn’t my business showing up in Google Maps? This is a great question considering that Google Maps is the primary search results shown by Google on smart phones, especially for locally relevant search queries. As I mentioned, Google Maps search results are relevant for nearly every market segment or industry especially at the local level. So it doesn’t matter if you are a law firm, restaurant, or dog walker… your best customers are simply pulling out their phones, saying something like “Ok Google, who’s the best….” and then getting the Google Maps search results. If you hit a speed bump while verifying your Google My Business listing, you can always call Google Local support (see steps above).